If you’re thinking about finishing an attic and/or considering adding a bathroom dormer addition to the project by punching a whole into the attic roof, there are a number of important things to consider first. Bathroom dormer additions can be an effective way to gain some extra square feet and headroom to put in a small bathroom in an otherwise tiny area. However, bathroom dormer additions can be complicated, and thus expensive to do. Below are some important topics to think about when considering a bathroom dormer addition. What Kind of Bathroom Dormer Addition? Are you considering a shed dormer addition, a dormer addition that has a roof line that runs parallel to the existing attic roof line? Or, are you considering a dormer addition where the roof line runs perpendicular to the attic roof line? The former one provides additional finished floor space, but with limited ceiling height gain. The latter one provides more floor space and headroom; however, a more complex roof design is required which adds to the bathroom dormer addition costs. 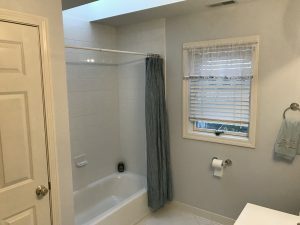 Is there a Bathroom Below the Planned Bathroom Dormer Addition? If you’re planning to install a bathroom dormer addition directly over an existing bathroom on a lower floor, that’s good. The plumbing supply lines, drains and vent stack are all nearby and can be extended up into the attic area by just going vertical, versus having to go horizontal and vertical. Thus, the bathroom dormer addition cost estimates you obtain from general contractors should not be out-of-sight expensive. Does Your Electrical Panel Have Capacity for More Electrical Outlets? A bathroom requires a GFCI breaker, so more than likely you’ll need to add another circuit breaker to the electrical panel. Check to see if there are open slots in the electrical panel to support the bathroom dormer addition. What is the Planned Square feet for the Bathroom Dormer Addition? In general, dormer additions provide a relatively small increase in extra floor space and headroom height, unless you plan to add on a dormer addition that is so large that it may not look aesthetically appealing to the outside of your home. So, in addition to extra construction costs, keep in mind both the inside and outside appearance of your home when planning a bathroom dormer addition. If the roof shingles are old, then you may be opening up a can of worms in terms of escalating costs. 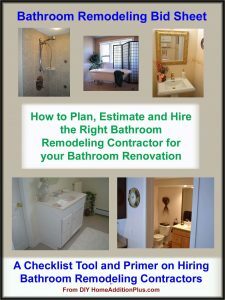 Use this Bathroom Remodeling Bid Sheet and save money and time, and prevent hassles on your bathroom remodel. To add on a bathroom dormer addition, you may need to also factor in the cost of re-shingling the entire roof. If not for needing to replace the old roof shingles, for ensuring that the new shed bathroom dormer addition or bump out bathroom dormer addition have roof shingles that match the existing shingles. You can expect to pay anywhere from $100 to $200 per square foot for adding on a bathroom dormer addition, depending upon where you live. The overall cost of the project will be higher with the more impact to the outside of the house required, e.g. having to remove and replace roof shingles and house siding. The above is just a rough cost estimate for a bathroom dormer addition. Again, there are many considerations and variables that can affect the cost of a bathroom dormer addition. This said, the best way to control the costs is to go the route of a shed bathroom dormer addition as it has the least roof impact, and position the bathroom dormer addition directly over an existing bathroom if at all possible.